Westfriesland.nl likes to put the beautiful region of Westfriesland in the spotlight. Its landscape is varied and dotted with picturesque linear villages, nice towns, nature reserves, sweeping views and leisure facilities. 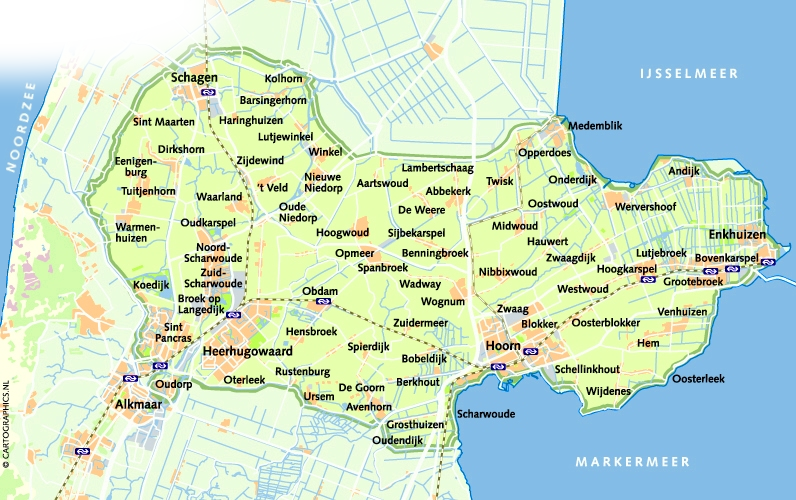 Westfriesland is fully encircled by the 126 km long Omringdijk, a national monument that used to shield the region from the water. Westfriesland boasts a wide range of museums, tourist attractions, authentic farmhouses, pretty little churches and of course the many windmills that were crucial to wrest control of the land away from the water. Together with these many assets, the numerous folkloric tourist markets and other events will keep you entertained and engaged throughout your vacation in this welcoming region. There are also plenty of options for affordable accommodation, which makes it attractive to stay a few more nights. Westfriesland is also an ideal base of operations for day trips to Amsterdam, Volendam or the many beaches on the endless Dutch coastline. Traversing the idyllic landscape is a pleasure for cyclists, motorists and walkers alike, and every village offers good opportunities to stop for a drink or a meal. In other words, simply enjoy the good life in this quintessentially Dutch region! Buiten Westfriesland Westfriesland heeft het!